The cattle to be slaughtered are relaxed first by warm shower. Then the cattle leading machine will lead the cow through driving path to the aerodynamic tip trunk. Hung up, the cattle then will be sent to the automatic bloodletting line by the Lift, and bleed. After changing the rails, they are sent to the five-process transporter, and the pre-cutting, decorticator, breast-opening, organ removing, half-cutting etc. Are conducted. The red and white organs taken out will be processed by the cattle synchronous hygienic inspection line, and the two halves of the split cattle will be sent to discharge the acid in the acid-discharging cabinet through the push-type track, so that we can get the beef of the best quality. ZBHT Slaughtering Machinery Co.,Ltd. manufacturing high-quality Cattle slaughter process flow and supply OEM, ODM service according to your personal requirement. 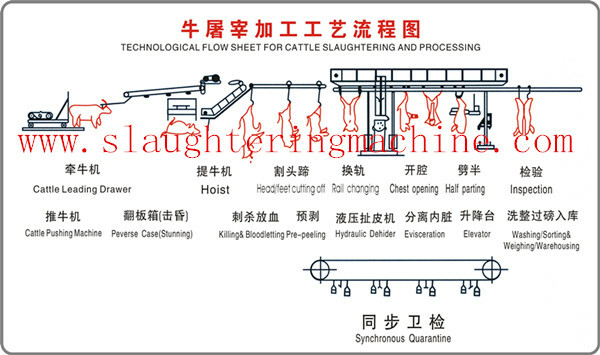 Our Cattle slaughter process flow and other Cattle Slaughtering Equipment is not only good in quality but also competitive in price, welcome to inquiry us about the details of Cattle slaughter process flow or other slaughtering machine products and accessory equipment.